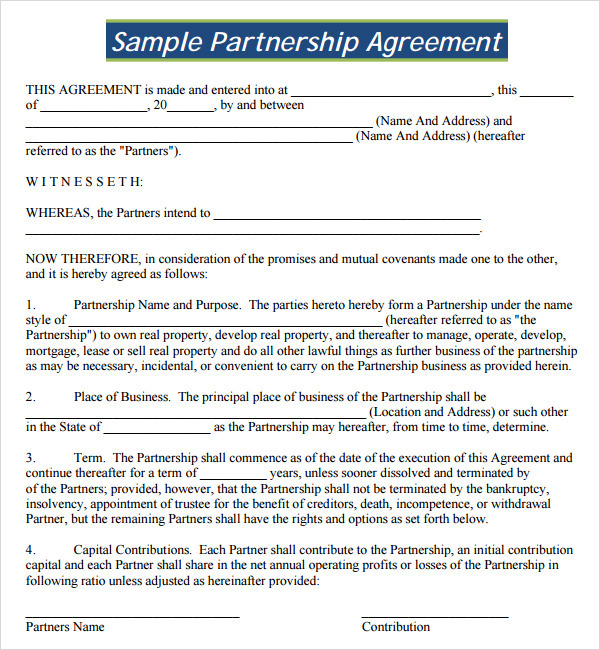 What is Partnership Agreement Template? A partnership is a business formed with two or more people. Each individual contributes assets to the business and has a share in the profits and losses of that business. Some partners actively participate in the business, while others are passive. When you form a partnership, the most important document is a partnership agreement. A partnership that begins without an agreement can be jeopardized if something happens to one or more of the partners. 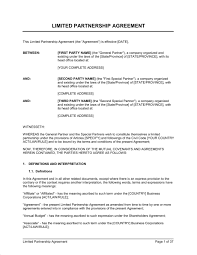 The partnership agreement sets out all the terms and conditions agreed to by the partners. In this document, every possible contingency is included. 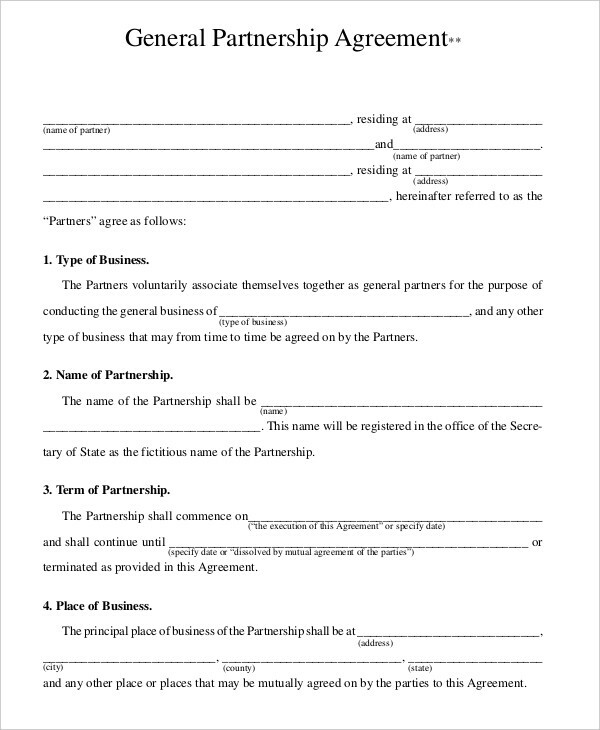 Here is a list of questions to be asked when preparing a partnership agreement. Partnerships have certain default characteristics relating to both (a) the relationship between the individual partners and (b) the relationship between the partnership and the outside world. The former can generally be overridden by agreement between the partners, whereas the latter generally cannot be overridden this way. The assets of the business are owned on behalf of the other partners, and they are each personally liable, jointly and severally, for business debts, taxes or tortious liability. For example, if a partnership defaults on a payment to a creditor, the partners’ personal assets are subject to attachment and liquidation to pay the creditor. By default, profits are shared equally among st the partners. However, a partnership agreement will almost invariably expressly provide for the manner in which profits and losses are to be shared. 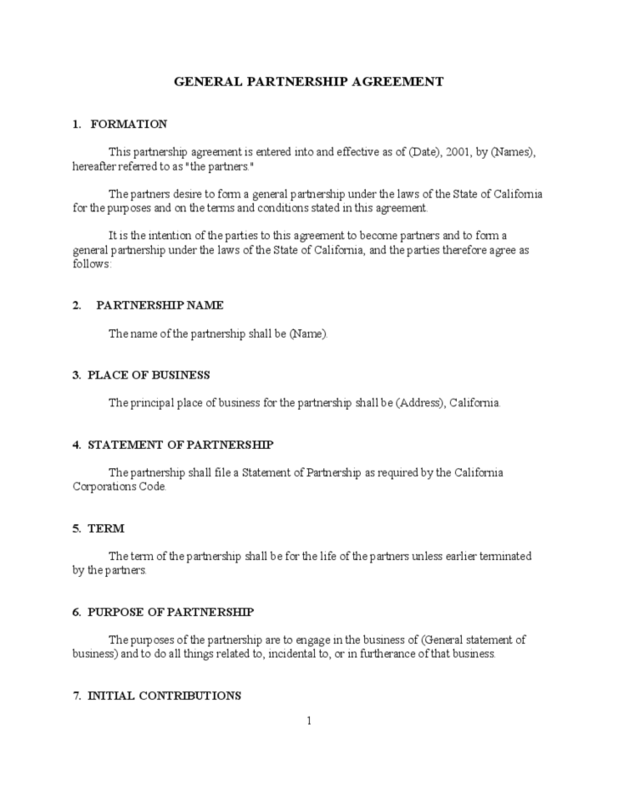 Each general partner is deemed the agent of the partnership. Therefore, if that partner is apparently carrying on partnership business, all general partners can be held liable for his dealings with third persons. By default, a partnership will terminate upon the death, disability, or even withdrawal of any one partner. However, most partnership agreements provide for these types of events, with the share of the departed partner usually being purchased by the remaining partners in the partnership. By default, each general partner has an equal right to participate in the management and control of the business. Disagreements in the ordinary course of partnership business are decided by a majority of the partners, and disagreements of extraordinary matters and amendments to the partnership agreement require the consent of all partners. However, in a partnership of any size, the partnership agreement will provide for certain electives to manage the partnership along the lines of a company board. 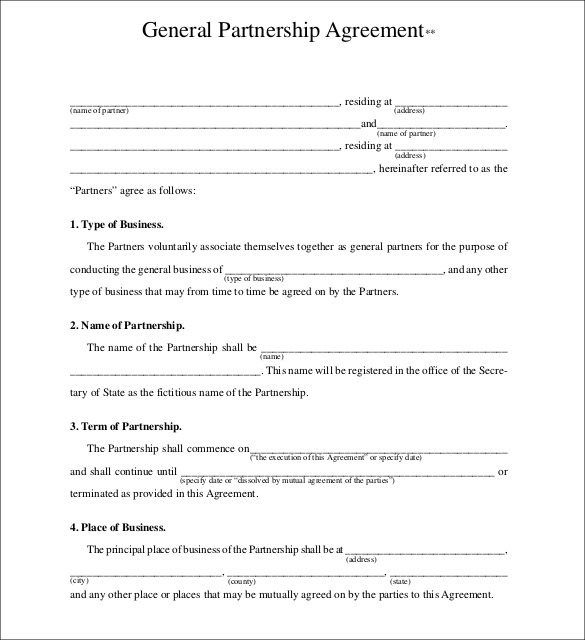 Unless otherwise provided in the partnership agreement, no one can become a member of the partnership without the consent of all partners, though a partner may assign his share of the profits and losses and right to receive distributions (“transferable interest”). A partner’s judgment creditor may obtain an order charging the partner’s “transferable interest” to satisfy a judgment. In any partnership, each partner must “buy-in” or invest in the partnership. Usually, each partner’s share of the partnership profits and losses is based on his or her percentage share of ownership. 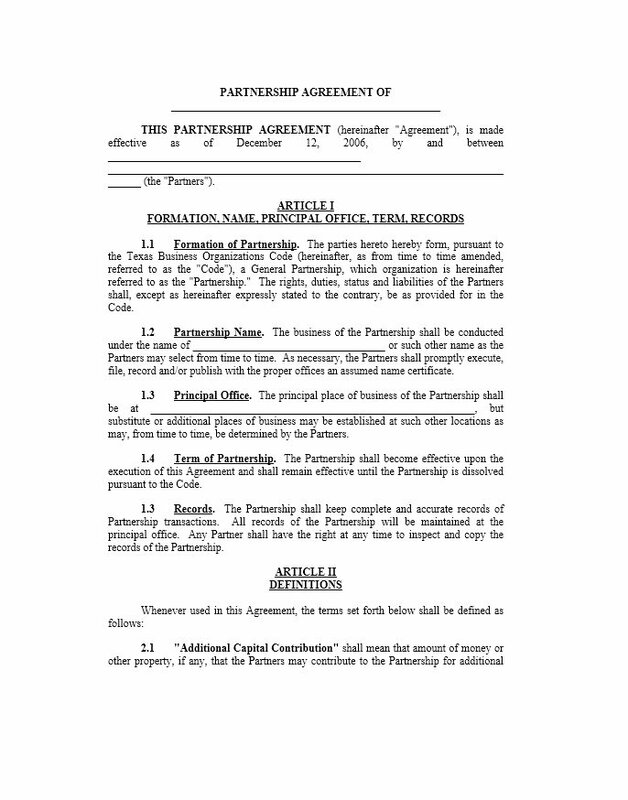 General Partnership: A general partnership is a partnership with only general partners. Each general partner takes part in the management of the business and also takes responsibility for the liabilities of the business. If one partner has left, all partners are held liable. General partnerships are the least desirable for this reason. 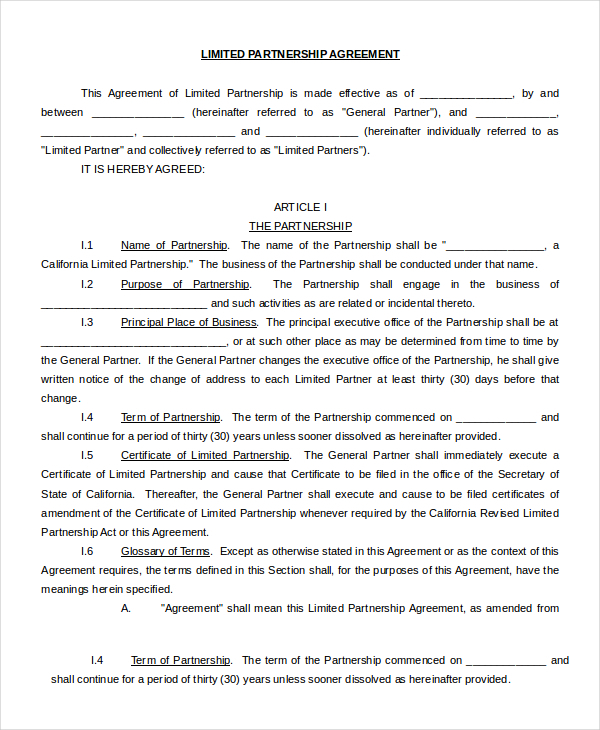 Limited Partnerships: A limited partnership includes both general partners and limited partners. A limited partner does not participate in the day-to-day management of the partnership and his/her liability is limited. Limited Liability Partnerships: A limited liability partnership (LLP) is different from a limited partnership or a general partnership but is closer to a limited liability company (LLC). 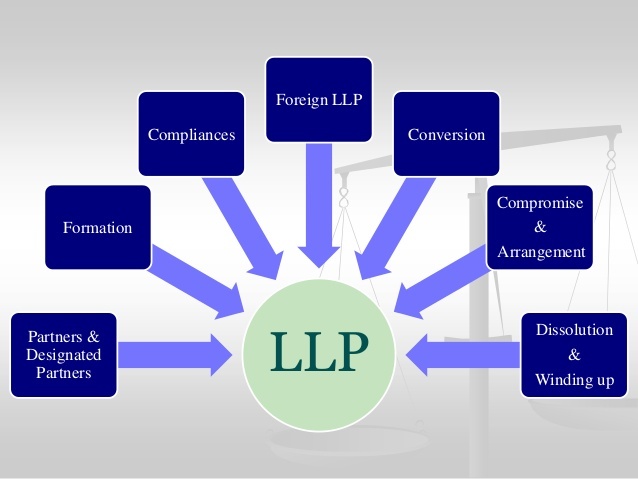 In the LLP, all partners have limited liability. LLC or Partnership? : In recent years, the limited liability company has supplanted the general partnership and the limited partnership, because of the limits of liability. But there are still cases in professional practices in which some partners want to be limited in ​the scope of duties and they just want to invest, having the liability protection. Joint Ventures as Partnerships: The Small Business Administration lists a joint venture as a type of partnership. 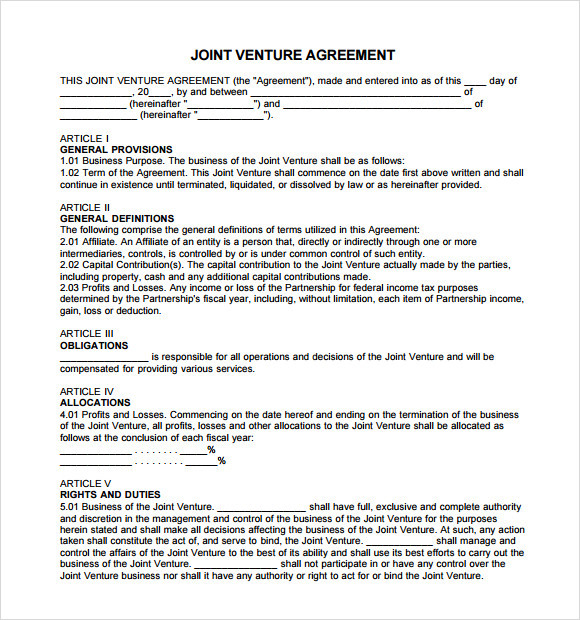 A joint venture is typically a partnership of different businesses formed for a specific purpose (like making a movie or building a structure) or for a specified time period. Qualified Joint Ventures as Partnerships: A qualified joint venture is a special kind of partnership in which two spouses who jointly own a business can elect to file separately to avoid having a file a complicated partnership tax return. You can read more about how qualified joint venture works, and the restrictions. Why Should You Form a Partnership Agreement? Dispute resolution: Every relationship has disagreements, and this is especially true in business relationships where lots of financial, legal, and business decisions have to be made. 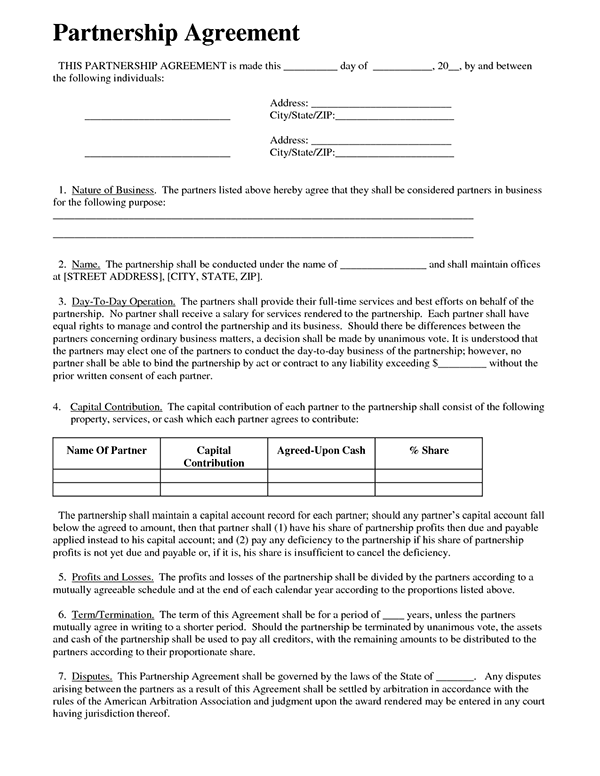 A carefully crafted business partnership agreement allows you to outline how disputes are going to be handled ahead of time instead of in the heat of the moment. This prevents the friction and expenses associated with legal action. Since this is a binding legal document, it’s always best to have an attorney guide you. 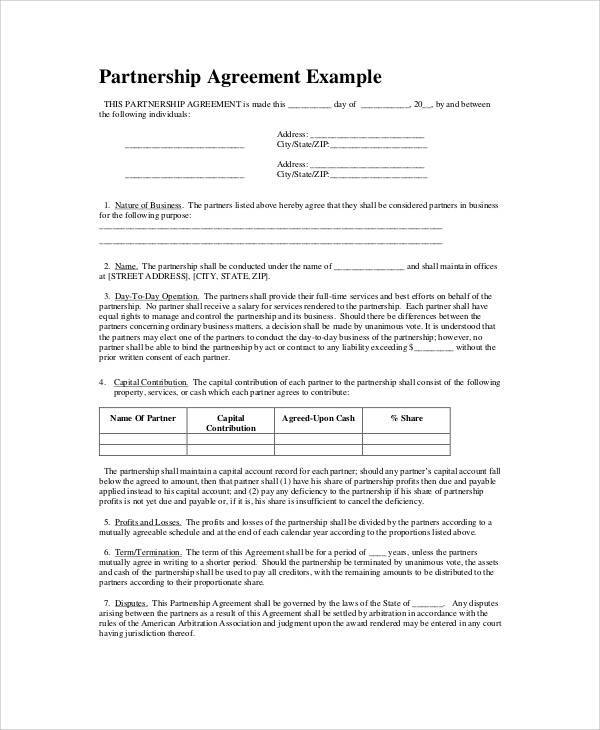 You can do some of the work yourselves by using a partnership agreement template, but have an attorney review it to make sure you didn’t miss anything. Dispute prevention: By forcing you to have an honest conversation about how you want to run the business with your partner, disputes that may have otherwise occurred may not occur at all. Clarify business structure: The process of putting together a business partnership agreement forces everyone to think about and get on the same page about how the business is going to be structured and run from the beginning. This allows decisions to be made efficiently and profits to be divided fairly. Enable business transition: There should come a time when one or more of the partners wants to exit the business, wants a partner to exit, passes away, or becomes disabled, there need to provision specifying what will happen to the business. Keep in mind that there are different kinds of partnerships: general partnerships, limited partnerships, limited liability partnerships, and (in some states) limited liability limited partnerships. No matter which type of partnership you are creating, you should have a partnership agreement. The name of the company, any other names that the company will be operating under, and the name of the parent company if there is one. If your company will use a fictitious business name (i.e. a trade name like “Sarah and Bob’s Bakery”), then that should be mentioned here. Statement of the company’s purpose. Generally, you will want to keep this fairly broad so you have the flexibility to adapt and don’t have to revise the partnership agreement every time you try a new experiment or business venture. Partner Responsibilities: Decide who is going to be responsible for which parts of the business. As discussed in our article on how to find the right business partner, at a minimum you need a partner involved with delivering your product and/or service, sales and marketing, finances, and management. One partner may have multiple responsibilities, and sometimes, responsibilities may overlap in the day to day of the business. However, you should list out any other areas that need to be covered and decide who is going to be broadly responsible for those areas. Personal Property Example: You are starting a landscaping business and one of the partners contributes a lawnmower. Does that mower become the property of the business? Client List Example: You are starting brokerage firm and one of the partners brings clients with them from a previous job. Does 100 % of the revenue from those clients flow into the business? Intellectual Property Example: You and your partners launch an online business, and one partner contributes software code. Is that code now owned by the business? Can other partners modify it? Ownership Split: Now that you have decided on responsibilities, workload, and which partners are contributing what to the business, you can come to an agreement on how ownership is going to be shared in the business. One partner has contributed to a significantly larger amount of property to the business. The partner thought of the original business concept and/or developed a beta product, secured a patent, or completed another critical first step. Working full-time while other partners are working part-time. The partner has successfully raised venture capital funding. Compensation/Distributions of Profits and Losses: Partners are not paid salaries. They receive distributions from the profits of the business. Do you plan on reinvesting profits back into the business? At what point do you plan on taking out profits and distributing them to the partners? How and when will profits and losses be divided up amongst the owners? Often, it’s based on contributions and ownership. For example, someone who contributes 60 % of the property to a business will typically own 60 % of the business and receive 60 % of the profits/losses. However, the setup may be different for your business if, for instance, one partner works a lot more than others or has more responsibilities. Will you offer guaranteed payments? If so, to whom, when, and how much? Partner Disputes: Being able to discuss and come to an agreement on differences of opinion is a must for any business to move forward and grow. Most of the time, collaboration on a day to day issues happens seamlessly. However, disputes are inevitable, and when the contested issues affect the future of the business, the agreement should lay out a method for resolution. The CEO has the final say. One partner has the final say on a particular part of the business. For example, on hiring and firing disputes, it may be the CEO; for product development disputes, the partner who is in charge of the product may have the final say. Vote based on ownership. For instance, someone owning 60 % of the business would have more of a say than someone owning 40 % of the business. Majority vote for businesses with an odd number of partners. Partners agree to use an outside mentor to resolve disputes. Partners agree to use an outside advisory board. Partner Death/Disability: What happens if a partner dies or becomes unable to participate at the same level because of a disability? Most business owners probably do not want their deceased partner’s heirs to be their new business partners. To prevent these types of issues a buy-sell agreement will be included in most business partnership agreements. A buy-sell agreement allows remaining partners to buy out the partner who is disabled or who passed away. Buy sell agreements also usually cover partner divorces to prevent a divorcee’s ex-spouse from becoming a business partner. You should also look into key person insurance (aka key man insurance). This type of insurance enables the business to survive the loss of a key person. The insurance company will pay out a benefit to the business in case an owner or key executive passes away or becomes disabled. 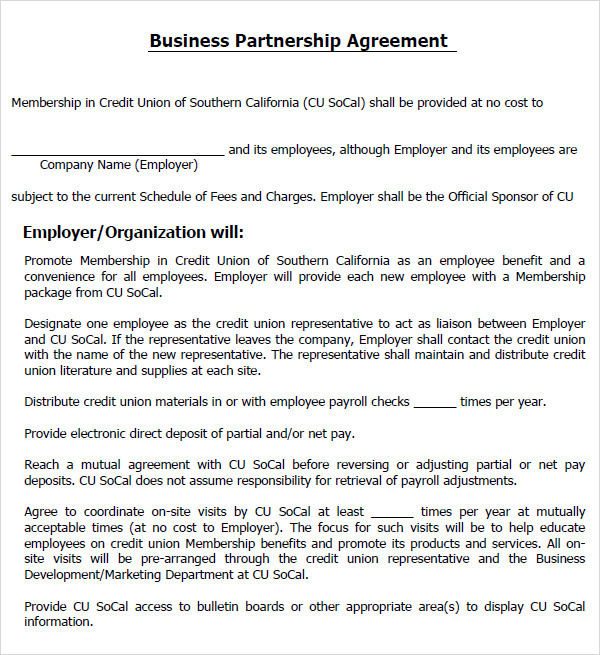 Bottom Line: Creating a business partnership agreement is a necessity for a small business with multiple owners. The agreement will cover the good times and bad times in your business. It covers how the business will be managed, how profits will be divided, and how disputes will be resolved. With a good partnership agreement under your belt, you can focus on running and growing your business! 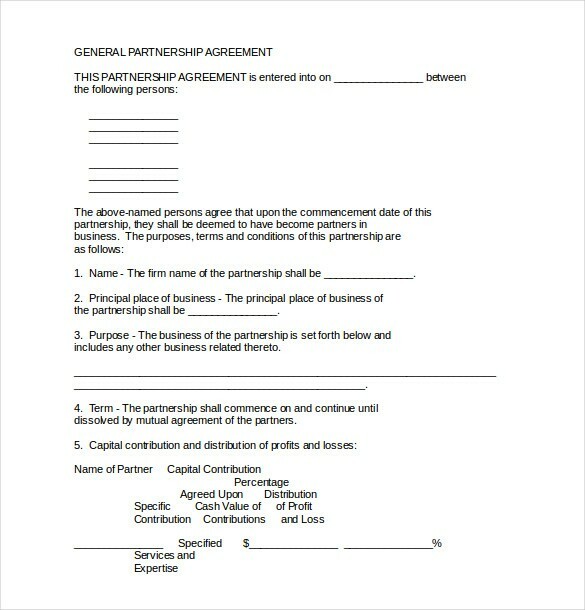 A partnership agreement is an important foundation document between two or more parties who desire to enter upon a business agreement.